Greeks are exhausted from years of economic crisis and the Orthodox church head is pleading with the European Union to reconsider its decision to limit the refugees it is accepting. Hieronymos II, Archbishop of Athens and All Greece, says he is pleading for help so Greeks are not left alone to confront the massive refugee crisis facing Europe. Archbishop Hieronymos wrote his impassioned letter for help to the general secretary of the World Council of Churches, Rev. Olav Fykse Tveit, appealing to international churches and the global community. "Substantial interventions are imperatively needed. "We consider that the manifestation of European solidarity, first of all through the re-examination of the decision to close the borders, but also through substantial efforts to eliminate the root-causes of the refugee crisis should be undertaken." 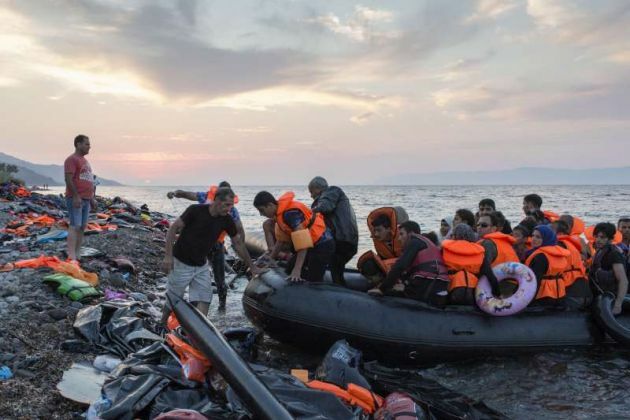 He said the Holy Synod of the Church of Greece has followed "the endless tribulations of the refugees flooding our small country," in his March 30 letter that commits the church there to continue its support for refugees. "In their long and difficult journey from war to peace, hundreds of thousands of suffering refugees cross, under dramatic circumstances, our country, distressed and drained as a result of the economic crisis." His plea coincided with one by United Nations Secretary General Ban Ki-moon on March 30 while speaking at a special UN ministerial meeting on the global responsibility for sharing Syrian refugees fleeing the civil war. "Five years into this conflict, Syrians are losing hope of supporting their families or educating their children...Communities hosting refugees in neighbouring countries are exhausted," said Ban. "Health, education, and public utilities are overstretched and under-resourced." Canada said on March 31 it will take in an additional 10,000 Syrian refugees, adding to the more than 25,000 received in the last few months, Immigration Minister John McCallum said in Germany. The United States had the day before reaffirmed its commitment to resettle at least 10,000 vetted Syrians in 2016 and increase the total number of resettled refugees from around the world to 100,000 by the end 2017. Archbishop Hieronymos made his appeal to the WCC, "so that people of the international community with institutional authority, good will, respected voice and social influence, join forces to solve the greatest problem and wave of refugees on European soil after World War II." He noted, "Our seas have become liquid graves. Our islands and our people stand with moving altruism on the side of the desperate." "We have heard pledges that increase resettlement and humanitarian admission to over 185,000," UN High Commissioner for Refugees Filippo Grandi said at the end of the meeting - signalling an increase of just 6,000 places, Reuters news agency reported. "Due to the authority vested in you, we therefore urge you to use every possible effort so that the civil war ('fratricide') in the broader area of Syria comes to an end," said Archbishop Hieronymos. That is needed so, "that people and families are no more uprooted from their ancestral homeland, and that those who are already living as refugees be assisted to overcome their pains." The archbishop said he shares the view of the Greek government "that our small country, exhausted from the years-long economic crisis, is not in a position to confront alone this major refugee issue."